Hi! I have bought my cyclamen on sale, it looked pathetic and nobody wanted it. There were no flowers whatsoever. So, I brought it home, and noticed tiny buds under the leaves. They looked whitish. Some of them dried out, some don’t grow at all and it seems like they are the same size all the time. But suddenly I have noticed one flower started to grow and finally bloomed! 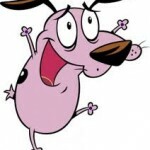 And it was pinkish red! How strange! My question is, should I do something to my cyclamen to help it bloom or just do nothing and wait and see? What to do with those dry buds? Cut them off or leave them like it is? 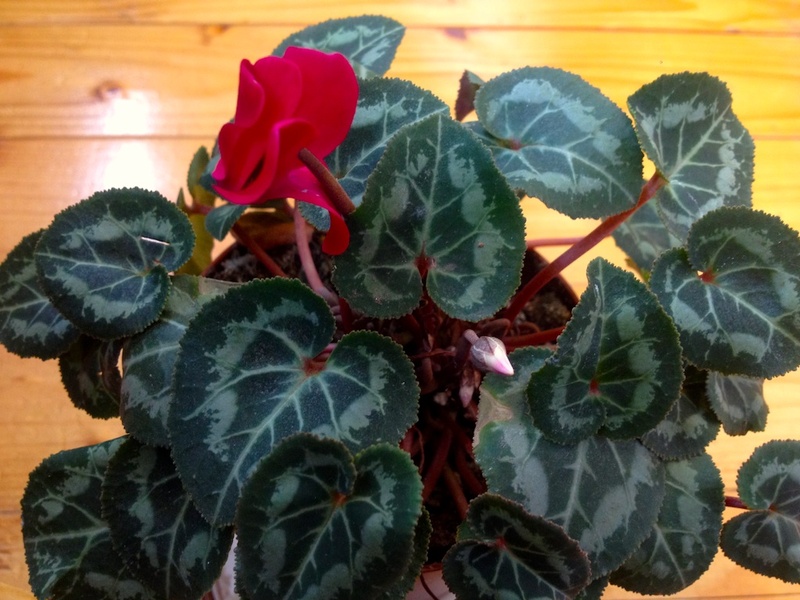 How should I water cyclamen when it is blooming? Does it need a lot of water or should I let it dry out between waterings? Here is my blooming cyclamen with one flower 🙂 You can see white buds there too, which don’t grow. Ukropchik Doctor Asked on October 4, 2016 in Houseplants. 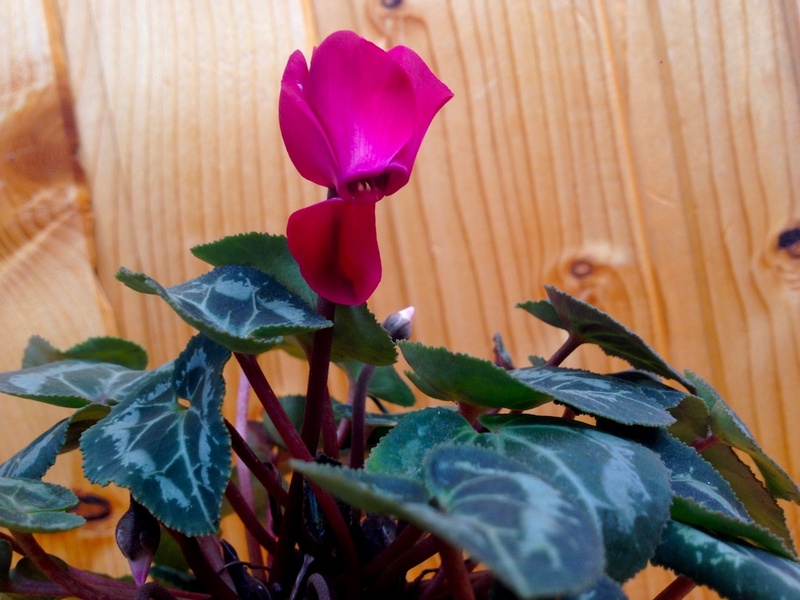 Potted indoor cyclamen may not bloom as profusely or produce the same compact growth inside the home due to light and temperature variations, but they will still flower with proper care. 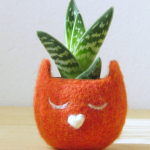 The first thing you should know is that this is one plant that needs to be kept cool. Cyclamen doesn’t appreciate temperatures much above 70 degrees and the dry atmosphere that goes with them. Cyclamen doesn’t like direct sun. Too much sun can stress or scorch plants so they don’t flower. Too high a temperature causes cyclamen’s leaves to yellow and flower buds to wither; too little light will produce the same result. A south window is preferred, but an east or west window also are suitable. Your plant will appreciate high humidity, i.e., placement in a shallow tray of water with pebbles to keep the pot above the water. Fertilize cyclamen every 3 or 4 weeks with a water-soluble fertilizer as you would your other houseplants, but don’t overfeed, as it will produce more foliage than flowers. Cyclamen flowers eventually fade. As soon as they are no longer perky and attractive, cut them off near the base of the plant. This keeps faded flowers from becoming a drain on the plant’s energy. To remove dead flowers or leaves, steady the plant at soil level with one hand, while using the other to reach in and pull off the aging stem with a snap. Mediterranean plant, cyclamen sometimes is called the “poor man’s orchid” for its flowers attractive, dark-green, mottled, heart-shaped leaves. Hope these Cyclamen care tips will help you to grow healthy plants, which will bloom all winter. Florist Vice Professor Answered on October 15, 2016.